Well presented two bedroomed apartment situated in the heart of Skipton Town Centre. Forming part of a mill conversion, with under croft parking and walking distance to the train station. THE AREA Located to the West of Skipton town centre in the popular Glista Mill, this home is only a short walk to the town’s amenities. Known as "The Gateway to the Dales", the historic market town of Skipton provides extensive shopping and recreational facilities together with excellent primary and secondary schooling. Within 10 minutes drive of the Yorkshire Dales National Park, the town is close to the popular holiday destinations of Malham, Grassington and Bolton Abbey. The town’s railway station has regular services to Leeds, Bradford & Lancaster/Carlisle and a daily service direct to London Kings Cross. The major towns of East Lancashire and West Yorkshire are all within easy commutable distance. B: An applicant has lived within the township of Skipton for at least three years. Where the applicant has had their only or main home within the township of Skipton for three years they must also fit one of the following statements. 1: A first time buyer. 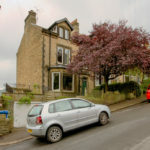 2: Occupied as his or her main home shared accommodation which in the written opinion of the Council is over crowded or is otherwise unsatisfactory by Environmental Health standards. 3: A person who requires smaller accommodation and is aged 60 or more and/or is a registered disabled person. COMMUNAL ENTRANCE HALL With access to secure parking, security entrance system and post room. Lift to all floors. Communal inner hallways with wide open stair to all floors. ENTRANCE HALL With steps down; laminate flooring, under stairs storage and a large storage cupboard house the hot water tank with plumbing for an automatic washing machine. LIVING KITCHEN 24′ 1" x 11′ 7" (7.34m x 3.53m) max Range of gloss wall and base units with laminate worktop , stainless steel sink unit and tiled splash back. Integrated appliances comprising; induction hob with extractor over, under-counter fridge, dishwasher and Electrolux oven/grill. Spotlighting and electric panel heater. BEDROOM ONE 16′ 0" x 9′ 4" (4.88m x 2.84m) Built-in wardrobe and electric panel heater. BEDROOM TWO 16′ 0" x 7′ 5" (4.88m x 2.26m) Electric panel heater. HOUSE BATHROOM Contemporary three piece suite comprising; low suite WC, pedestal hand basin and bath with thermostatic shower over. Partly tiled walls and fully tiled flooring. Chrome heated towel rail, spotlighting and extractor fan. OUTSIDE There is a parking space within the secure communal ground floor parking area. There is a large communal garden area to the rear of the building abutting the Leeds to Liverpool canal towpath for exclusive use by the residence. TENURE Leasehold – The property benefits from the remainder of a 999 year lease beginning in 2008. There is a ground rent of £200 per annum and the current service charge applicable is approx. £580 per quarter. VIEWING Strictly by appointment through the agents Carling Jones – contact Tom Exley at the Skipton Office on 01756 799163.